Look at the box score for the Celtics – Garnett with 13 points after shooting 5-13, Paul Pierce with 19, not bad but nothing too impressive, Ray Allen with 12 points and another bad shooting night, 4-11, and Rajon Rondo, with 10 points while shooting 5-15. Shouldn’t win with those stats, right? In a scrappy, rugged, hard fought game like last night, you win with hustle and defense, and despite Kobe going for 33 and Gasol for 21, the Lakers didn’t have much else. Derek Fisher was human again, Bynum wasn’t healthy and effective on offense and Artest, well, Artest. The bench? Odom scored 10, and that was it. Jackson stayed with the started all game, and eventually, his team crashed with fatigue, while Boston seemed to come to life during the fourth quarter, with Nate Robinson (12 points) and Glen Davis (18 points) delivering in the clutch. Boston’s bench – 36, Lakers bench – 18. Glen Davis just dug and dug in the paint, wearing out Gasol and grabbed four offensive rebounds, doing most of the damage during the Celtics’ run in the fourth. 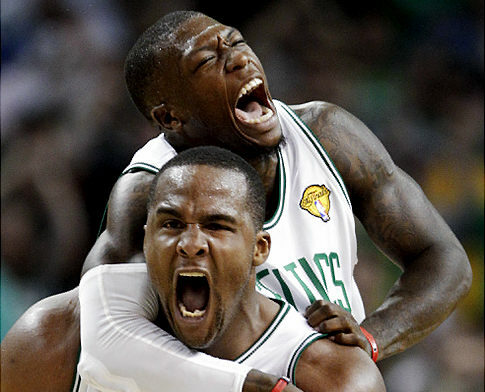 The Celtics had 16 offensive rebounds and scored 54 points in the paint, 20 more than the Lakers. Robinson did what he did against Orland in the end of that series, outplaying Rondo who doesn’t seem his aggressive self aside from a few moments. Tony Allen was horrible offensively again, but played terrific D on Bryant in the fourth, not allowing Kobe any easy looks at the basket and frustrating him by never letting him get to the ball without him breathing down his neck. Rondo came up with the big steal after Kobe tried to find Odom in the end, sealing the Celtics’ win, making it 2-2 before the final game in Boston on Sunday, before we head back to LA. Jackson needs to find his bench – Walton didn’t play at all and Vujacic got 7 minutes only. Derek Fisher can turn it up once in a while, but he can’t have two games like the one on Tuesday. Farmar needs to get more time. Second thing Jackson needs to do is to set this offense right – The team was stuck too many times last night, and if it wasn’t for Boston’s slippery hands and missed opportunities, the game would have been over much earlier. He also needs to pray for Bynum to get healthy, and fast. He needs beef against Davis, Garnett, Rasheed and Perkins. 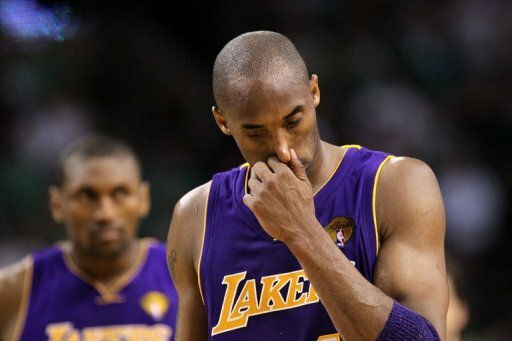 Kobe, it seems, can’t do it by himself, he needs more than just Gasol to help him.